Why Isn’t Assam in Focus? It’s a shame that the misery of lakhs of people is a non-issue in a nation that trumpets to be the largest democracy. The entire country – the politicians across the length and breadth of our nation, a large section of the media, and the ‘common man’ which is another idiom for the middle class in our country who are not really ‘middle’ but a trifle elite in socioeconomic terms – are all busy analysing the economic ‘reforms’ particularly the foreign direct investment (FDI) in retail, insurance and other sectors announced by the Central government, the reactions of the opposition parties such as BJP and Trinamool to these declared measures and the government’s arguments in defence. After the Coalgate, prime minister Manmohan Singh and his colleagues have successfully veered the public (rather, the middle class) attention to the new googly ball of changes in the rules governing the FDI. It is really distressing and shameful that when a huge calamity has befallen in some parts of the country, no one seems to be bothered. To the north-east of our nation, large parts of the state of Assam are under water due to heavy flooding of the river Brahmaputra. The extent of displacement of people is mind-boggling. Over 30 lakh people are affected and a large portion of them are displaced. The villagers have lost their homes and belongings to the deluge. Some of them are taking refuge in school buildings if and where available. Several are in the open – children, women and old men included. This is supposed to be their ‘temporary’ shelter. However, most of the villagers have permanently lost their homes. Where will they go? How will they manage the rest of their lives? It is a horror story. In any other country such an issue would have been the main focus of the governments – Central and state. It would have been a huge national concern. It is miserable to find that this matter has come to be a non-issue in a nation that trumpets to the world that it is the largest democracy. Is democracy only regarding voting in the elections? Is the ‘largeness’ only about the number of inhabitants in the country? If we thought that this was a one-off event, a once in quarter century mishap, we would be wrong. 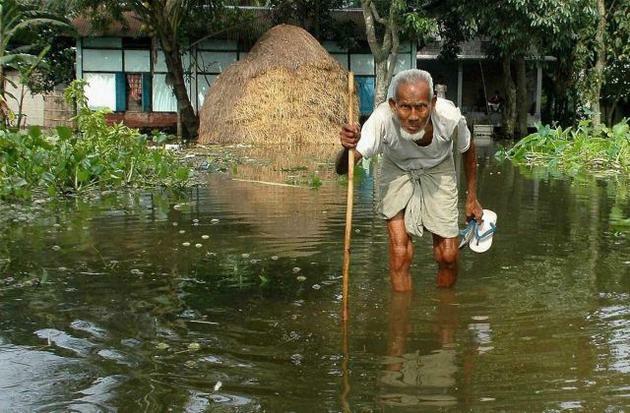 Floods take place with regularity, almost every year in several parts of the country, particularly so in Assam. What did our successive governments do regarding preventive measures? Obviously, nothing. In today’s technologically and managerially advanced world it should not be difficult to find solutions to the problems of meandering Brahmaputra or overflowing Ganga or Mahanadi. Unfortunately, the lives of villagers in remote Assam or interior UP or Orissa come cheap to be sacrificed to the vagaries of the monsoon and the rivers. Really speaking, it is not a ‘natural’ calamity; it is the result of an abject neglect by the governments – mainly the Central government and to some extent the state. Because, the government at the Centre claims to be busy with the matters of loosening up FDI norms and increasing the nation’s economic growth - primarily a desperate effort to refurbish its own image abroad. Prior to the current crisis of floods, five lakh people of Assam became homeless due to the socio-political problems arising out of the unchecked illegal migration of people from Bangladesh and the internecine feuds that would ensue large-scale demographic changes. The Union government has done precious little by way of mitigation of this chronic problem. The media and the news-savvy people of this country seem to have forgotten all about this calamity. It needs to be clarified at this juncture that the issue is not only about Assam; the latter just happens to be the current victim of calamity. The point is that, most of the times, the government’s priorities have not been right. The entire approach to the problems of this country has increasingly been ‘top-down’. It is assumed that if the top stratum of the society benefits, the same would trickle fast down to the bottom. This is not true. Even in the definition of the ‘bottom’ there is confusion. The city-dwelling white-collar working class people are not the ‘aam aadmi’. Real India lives in the rural hinterland and in the wretched slums of the cities where people live below the famous Rs 28 a day. The so-called trickle-down is going wrong because the government, the administrative machinery and the political vision and will that drive the machinery are all dysfunctional. In this warped economic ‘logic’ borrowed from the West, the present government and the prime minister – who is claimed to be the forerunner of this line of thinking - tend to overlook the obvious miseries of the multitudes. The miseries could be the daily hardships and the calamitous ones like the mass displacements due the floods of Brahmaputra. The distorted logic of the professed free market can be heady enough to numb the senses to the pains and wails of the suffering lot. It can dull the sight to the malevolence of unbridled corruption and plunder. If the rulers in New Delhi think that freeing of FDI, reducing the subsidy on items like diesel and LPG and similar ‘reforms’ will be the magic wand that will do the job they themselves are not doing, they are either living in a world of delusion or they believe that the so-called aam aadmi’s attention can be diverted by economic gimmickry.